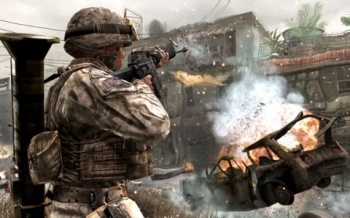 The terrorism expert quoted in a Russian media report that linked a terrorist attack to Modern Warfare 2 has stood up to defend himself. After a terrorist bombing at Moscow's Domodedovo Airport on January 24, Russian media outlet Russia Today ran a report that attempted to link the "No Russian" scene from Modern Warfare 2, quoting expert Dr. Walid Phares in the process. While Phares' edited words in the report implied that he might also link Modern Warfare 2 with the bombing, he's written a lengthy response to the report that reveals the truth of his beliefs. The clips of Phares seemed abruptly cut, and evidently this was the case. Phares writes that the negative reaction by the videogame blogosphere to his words was unwarranted, because while the intention of Russia Today's report was obvious, the answer he gave in the expanded version of his interview with the outlet was quite clear: "Games do not create terrorists." Phares' entire response emphasized that while terrorists do use games for certain training aspects, whether they be custom-made games played on a LAN or products built for entertainment to "meet the infidel" online, these games themselves have nothing to do with the spread of terrorism. He believes that games could "eventually influence a crazy guy who may go on a rampage," but the terrorists responsible for the Domodedevo bombing "aren't isolated gamers but part of an ideologically motivated network."